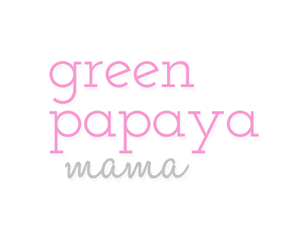 Please visit my new page address for Green Papaya Mama by clicking HERE. Hey guys, I'm still working on the wordpress move. I've been so busy lately sometimes all I want to do is chill out like our old man in this picture, Mana. 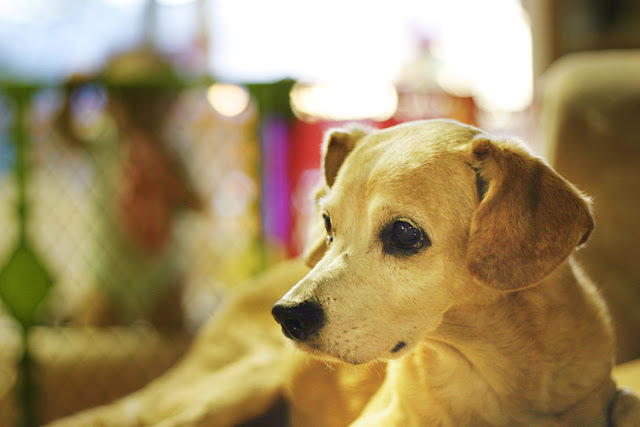 He's getting old and well, all he does is eat, sleep and poop. It must be so nice to live a dog's life. Hey everyone! I'll be a bit M.I.A. 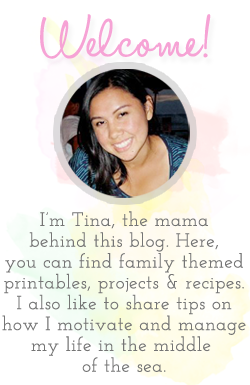 this week because I decided to move to wordpress and get my own domain as well. It's scary because I've used the blogger platform for so long. Anyway, I hope to have the new site up in a week or so. See ya there soon! I'm so excited to be finally sharing a recipe after so long! 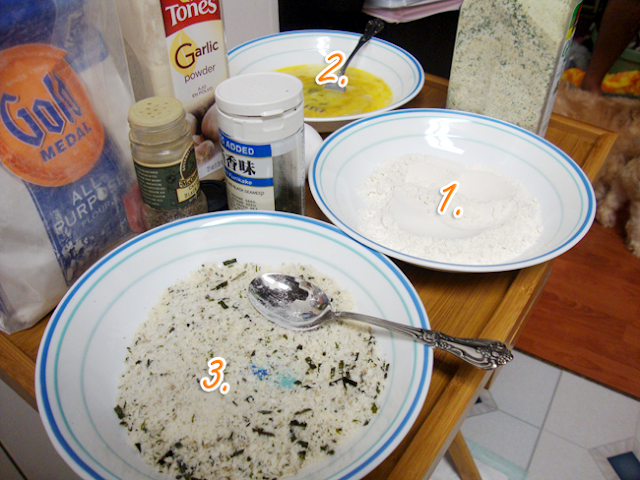 This is a recipe I came up with because we use this type of breading for a lot of our dishes at home. I thought why not use it with pork chops? It's super easy and yummy! Ok first, did I mention that i'm using center loin chops. Use whatever you like, but the thickness of these were about 3/4". Here's a hint, buy them from the frozen section if you want to save some money. Less than $4.00 for 4 pieces! 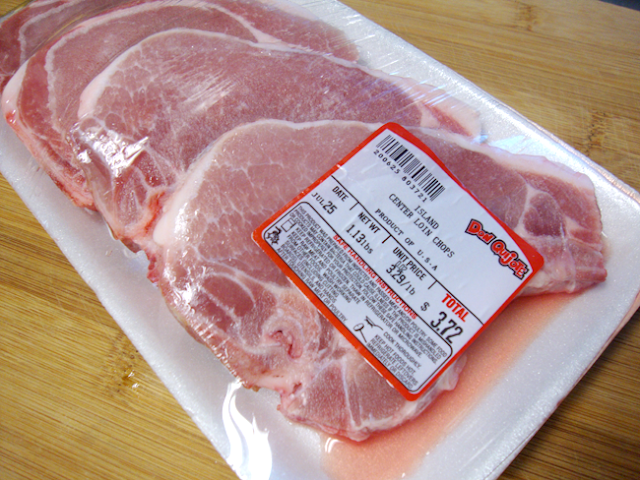 Remember, thaw out your pork till it reaches room temperature. This way they cook evenly. 1. Dredge in all purpose flour. Coat pork on both sides evenly and shake out excess flour. 2. Dip in egg mixture. 3. Dip in crumb mixture. Then fry on both sides for about 4 minutes. Let them rest on a rack for at least 10 minutes then enjoy! Mix eggs and soy sauce in bowl. Place all purpose flour in bowl. Mix panko, garlic salt, pepper, garlic powder and furikake in another bowl. Dredge pork chops in flour, shake excess flour off. Dip in egg mixture, than coat in last bowl with panko mixture. Turn heat to medium and add your oil. Fry all chops for at least 4 minutes on each side till the turn golden brown. 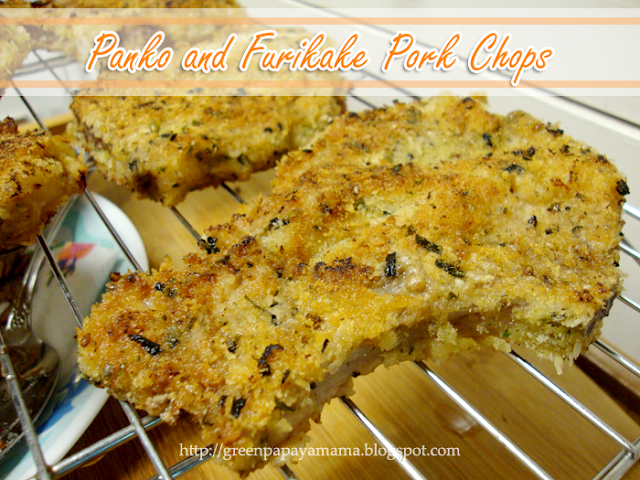 Place pork chops on a cooling rack for 10 minutes than cut and enjoy! It's as American as apple pie and is the perfect comfort food. Grilled cheese you had me at first bite. Here's a round-up of some of my fave recipes I gotta try soon! Chicken Fajita Grilled Cheese: Kevin comes up with the most incredible recipes. I've been a fan for years. French Onion Soup Grilled Cheese: Two of my favorite things in one? Gahhh I die for this. Brie and Blueberry Waffle Grilled Cheese: I'd never though to put waffles and grilled cheese together. Darn you for thinking of it first. Grilled Goat Cheese with Wild Garlic Pesto: No clue what this site is really saying because it's in french and my translation isn't the greatest. But damn, it looks so amazing I want to jump into my screen and eat it right now!